Get a TRIPLE Bonus for the Month of July! Thinking about publishing? July is a great month to do so! Starting today, Outskirts Press self-published authors can take advantage of our Triple Author Copies Promotion! 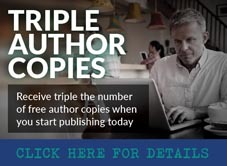 With this promotion, you will receive TRIPLE the number of free copies of your book when purchasing the Diamond or Pearl self-publishing packages! The ultimate Diamond publishing package offers the greatest profit margin and the highest number of free options of any publisher. It includes digital format, author webpage, and a customized cover. During the July promotion, Outskirts is offering Diamond authors 30 free copies upon publication. The full-color Pearl publishing package from Outskirts Press brings authors’ color interior publishing dreams to life. All Pearl books include standard interior color formatting, an ISBN number, a price-embedded barcode, and unlimited wholesale printing, fulfillment and distribution. And in July, Pearl authors can triple the standard number of paperbacks and bring home 15 free copies. To receive the promotion, simply enter the promotion code TripleBooks when checking out of your shopping cart while purchasing the Diamond or Pearl publishing package or you can click here for more information. Your book matters, let’s make it your way. Click here to get started! How the author will get to know that the number of books sold? And when the author will receive his or her royalty? me after the the publication of my second book titled “Just Get A Better Life “. A line in reply will be very much appreciated. Hi. Thank you for your comment. I will have a member of our book sales team reach out to you directly.